Martevuius Adams (C) put on an amazing game in the last round for league's leader San Pedro T. and that's him to receive a Interperformances Player of the Week award for round 12. The had a double-double of 31 points and twenty three rebounds, while his team edged out Belize City D. (#4, 6-4) 71-68. The game was between two of the league's top four teams. It allowed San Pedro T. to consolidate first place in the Belizean NEBL. San Pedro T. have a solid 10-2 record. Adams has many years of experience at San Pedro T., through which he has constantly improved. has impressive league stats. He is league's best scorer averaging so far 19.6ppg, leads league in rebounds with 9.5rpg and is league's best passer with 0.9apg is in league's top in and averages solid 54.1% FGP. The second most remarkable performance in last round's games was another San Pedro T.'s star - American guard Jihad Wright (193-G). Wright impressed basketball fans with a double-double of 18 points and 15 rebounds. 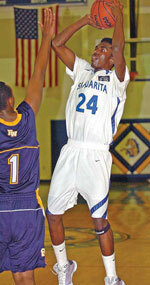 It was enough for San Pedro T. to edge the lower-ranked Belize City D. (#4, 6-4) by 3 points 71-68. It was definitely game of the week between two contenders to the title. San Pedro T. consolidated its place in the very top position of the standings. His team lost just two games this season, while they won 10 matches. Wright is one of the most experienced players at San Pedro T. and similarly like has a reputation of one of team's most reliable players. He belongs to the best scorers in the league with 14.1ppg (#9). His other stats are also decent: 10.3rpg and 4.6apg. The third best performed player last round was Roger Reneau (F) of Orange Walk RR (#7). Reneau showcased his all-around game by recording 18 points, fifteen rebounds (!!!) and six assists in the last round. Despite Reneau's great performance Orange Walk RR lost 81-82 to slightly higher-ranked Verdes (#5, 4-6). But his team cannot count on just a single player as he also needs help of the other teammates. Orange Walk RR can only dream about fighting for top spots in the league. They have extremely bad season and 1-10 record places them at the very bottom of the standings. Too bad for Reneau he does not play for a better team. But maybe if he did, his season stats would not be that high. 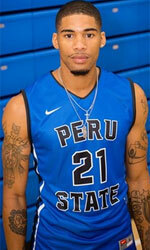 Reneau has individually a great season in Belize. After 11 games, he made it on the list of the league's leaders in assists with 4.1apg (4th best).